I don’t want to say anything too negative about any of these logos, because they are all the hard work of talented people. The one one thing that I always think about is what the imagery is going to communicate, and I’m worried that if you were to view [the Tampa Bay Ray’ logo] from far away, it might look more like a logo for a seafood restaurant than a baseball team. How are those the logos they used for the Yankees and Dodgers? They both have a very iconic team logo that would be at the very top of the list. What is with the preference to birds? I am a huge Blue Jays fan and I wouldn't put them anywhere near the top. Designers always rank that Dodgers logo really high, and I just don't get it. It's not a bad logo, but it doesn't wow me. Red Sox and Detroit are way too low. Actually, I think I agree with most of these rankings... my biggest quibbles would be the Blue Jays (way too high) and Giants (too low, shouldn't be top 10, but it's at least average). Those are the official logos as designated by the teams. The interlocking NY would rank much higher on any list. The rankings are the fans'. The pro didn't specifically rank them, though he said he'd put the Jays first (I'm with Zonk and Rusty in that it wouldn't be my top choice). My top 3 would be Angels, M's and Tigers, but that's only because the A's don't use the damn balancing elephant as their primary logo. So the Tribe (finally) ditches Chief Wahoo, and these folks go ahead and rank their new official logo at the bottom. No pleasing some people! As a kid, I gravitated towards teams that had animals in their name or logos. It animates the logo. That might explain the Blue Jays. Big disappointment to me was Detroit. Something really classy about it. I liked the comment on the Red Sox logo that it's not trying to be menacing or threatening, it's just simple and that appeals to the traditional nature of baseball. I liked the article, I thought Andrew Crane (the designer) did a great job with his comments. I can see the Miami logo being polarising. I like it higher than #20. It's going to be tough for Cleveland for obvious reasons. How soon before they can move to something more interesting? And when they do, what will it be? Baltimore I like higher than #10. And when you're talking logos, you gotta be watching Logos Galore. A good place to mention that in the last couple of years, Baseball-Reference has featured logos from Chris Creamer's wonderful sportslogos.net. B-Ref just chooses one to display on a team page per year, but Creamer has all kinds of alternates and other information (as well as lots of other sports). The weirdest ranking was the Brewers at #13, with a logo that consists of a nondescript "M" on top of a piece of wheat. I get what it was getting at, but visually it's one step above that Indians' "C" and the Rockies' "CR". Anyway, if you want real logos, these are real logos. If nothing else, they obviously weren't designed by a committee. That's kind of an odd critique. How many teams' logos could possibly be menacing or threatening to begin with? The Tigers, the Pirates, the Diamondbacks...the Braves and Indians if you're into racist stereotypes...I guess the Reds if it's the '50s, thus the Redlegs. What others? Cubs are more cute than menacing at that age. Maybe Giants? There's a Padres joke available here, but maybe that's in poor taste. 11 - He mentions that baseball does a better job with that than the other sports in general. I feel like if they were making the logo today from scratch the Socks would be snarling or or attacking in some way. I'd like the original logo paired with today's bird-ball-leaf design. The addition of Toronto and Blue Jays inside the larger circle is too busy for me. Dozens of people die from sock attacks each year. It's just not reported in the media. The average human consumes 8 socks per year in their sleep. That's kind of unfortunate, since some teams obviously just submitted the cap logo. The Rockies have a nice purple mountain logo akin to the badge-type logo that the other teams submitted, which both designers admit is a lot better than the simple CR that they actually ranked. Good article. I learned a couple things about design. The mention of the Blue Jays' inline, all-caps typeface was interesting. I thought that was sort of an all-purpose 80s aesthetic, but in baseball terms maybe it's limited to the Blue Jays. I didn't realize the Diamondbacks still had that A as their primary logo. They totally changed their color scheme from the Randy Johnson era but they kept the same shape with the new color scheme. The most clever recent logo might be their snakehead-shaped "db", by the way. I was wondering what happened to my other argyle, but fortunately it came out naturally. Right. Lots of snarling and aggressive creatures in minor-league baseball (my favorite is the Kannapolis Intimidators' angry letter K, or the Jamestown Jammers' angry grape). But in the majors they keep it traditional, with the exception of when the Blue Jays made their bird angrier around ten years ago (and also created the bizarre muscular blue jay). Then they changed back. It's become a joke that every time an NFL or NBA team redesigns its logo, the animal gets angrier. Search for "cardinals logo" and notice that the Arizona Cardinal is getting angrier but the St. Louis one is the same as ever. I became a Cubs fan back in the 50s because I liked their uniforms. Don't think that logo has changed in the last 60 years. To be fair, the block C is terrible. How many when they're awake? The first 5? 10? times I saw the block C I had no clue what team it was. Cubs? Reds? Bears? Blackhawks? Some college? Agreed with you on this. Totally agree how the Pirates P looks much better on black. A classic elegant Pirates black hat looks awesome, so I thought #24 was low. I basically love the old school classic looks. Detroit also seems low. The Yankees interlocking NY may be the most iconic logo in sports. The addition of Toronto and Blue Jays inside the larger circle is too busy for me. You're right, there's a lot to unpack there. I think it's balanced despite that, but I can see people not liking it. It's interesting that they felt they needed to include both "Toronto" And "Blue Jays". I admire the ones that don't put any text in at all (Miami, Detroit, Red Sox). I mean, I admire it as long as it looks good. But that Blue Jay has been around for 40 years now, they could have more confidence that his image doesn't need as much propping up as they gave it. Oh yeah, I had totally forgotten that. In retrospect, kind of the epitome of the steroid era. The Orioles also eliminated the happy Oriole for the ornithologically correct one. Never understood that. It's a logo, not a drwaing in a science book. Have your ever smelled a pair of sweat socks? That is pretty menacing. The Orioles also eliminated the happy Oriole for the ornithologically correct one. Here's the Orioles logo during Brady Anderson's 50 home run year. I like how the shark goes from eating the stick because it's in front of him and he can't not to destroying the stick in a rage. That tiger is great. It looks like something from Li'l Abner. My favorite logos (not just in baseball, but in general) are either something like the Red Sox (with a simple design element that does not need any lettering or identification at all) or stylized lettering (like the Tigers and Cubs, or the Yankees interlocking letters that oddly was not used) that can basically stand my themselves. Less is more. I love the Cardinals logo in principal, but I would ditch the "Cardinals" half of the logo. The Red Sox have the confidence that they don't have to EXPLAIN who they are. The Cardinals should too. At first glance that Dodgers logo looks like a shower; upon further review...OK, I see it now. The job of the logo is to give you instant recognition at a glance, so if you must study it to figure it out, the logo has failed in its job. The ones that jump out most to me are the Pirates "P", the Nationals Curly W (with extra free advertising courtesy of Walgreens Drug Stores), the Athletics (mostly because of the Kelly green color), Red Sox, the old Orioles cartoon bird that they did away with, Seattle Pilots Mariners, Cubbies, and I guess Blue Jays. Shape and color play a big part for me, color-blind people I guess not so much. I'd never noticed it, but that's a snake head in the A, too, right? I think that's why the 'crossbar' is weird. It makes the white snake head look like a diamondback. Andrew: I like this one, but I am going to guess that it may not have been ranked high by fans because it is so new. Baseball is all about nostalgia and that particular feel from the past. This logo doesn’t necessarily have that to pull from. I wouldn't expect a young punk to know this, but the Curly W logo is not new to the Expos-version Nationals. It goes back even before the 1984 original Karate Kid movie. Why, it even goes all the way back to when Teddy F. Ballgame managed the 'Nats. Or does it go even farther back to when Don Zimmer played for the Senators? It's just a bit amusing and amazing what I could turn up in a few minutes of Google searching that the "professional" designer couldn't be bothered with. I always loved the Mariners logo, but part of that is no doubt nostalgia from the Griffey/ARod/Johnson/Edgar teams of the late 90's, one of the most exciting (and disappointing) teams ever assembled, IMO. The Cardinals are missing a golden opportunity (copyright infringements be damned) by not using the red Angry Bird with a bat behind it, seeing as it's basically shaped like a baseball and all. The White Sox is another classic logo that really pops. All three of those would be in my top 10 or even 5. Among the newer ones, I really like the Astros for the reasons given in the comment. The star and their shade of orange are iconic by this point. I also LOVE the Marlins logo since it's so perfectly Miami. They're the one team that can get away with a logo that could be used for a nightclub. I think the Mariner logo is the best in baseball designed in the last 30 years; I would have ranked them just ahead of the Angels' logo, which I also think is fantastic. Half of the top ten — Cardinals, Cubs, Dodgers, Orioles, Mets — have enormous brand equity built into that logo. I'm not saying those logos are bad, just that it's impossible not to have instant emotional reactions to those logos, which is what makes them so great. I'm surprised Boston and Detroit aren't higher. The Tigers' D lettermark is amazing. Astros too high. Braves too high. Diamondbacks too low. Pittsburgh is a lost opportunity. The Angels, Tigers, Brewers, DBacks, Nats, Houston, Miami, and A's all have single-letter all have single-letter icons that are far more interesting and pop more fully than the Pirates' P. The Pirates really should be looking to create something that's more interesting. They have so much history to draw upon, it's a pity that this boring, predictable lettermark is all they could come up with. Even just adding a black keyline around the yellow would make it pop so much more. You want bold simplicity, not invisibility. It goes back even before the 1984 original Karate Kid movie. Well, perhaps that guy worked for Walgreens. This list is just awful. The old English D, the Yankees and Dodgers hat logos and the Sox' logo are all top 5. No doubt about it. You only need to look at urban fashion for the last 30 years to see that. Classic, timeless, simple logos with immediate brand cred in one way or another. In general I thought the list was heavily biased towards more elaborate designs. And it goes back to 1904, making it the second oldest in the Majors, next to the A's. The Cardinals logo first appeared on their uniforms in 1922, while the top hat and bat logo of the Yankees didn't come along until 1946. I think the basic problem that Mr Crane cited for the Dodgers was the angle of the fly ball, it looks like a pop out whereas if you rotate the angle it would look like a line drive or something. That one has never stood out to me, I dont immediately associate the Dodgers with it so I get the critic. I always liked the Pirate that they created in 1967, a handome looking guy with a slight grin. They and the Reds both underwent redesigns in the late 60s and had huge success a few years later. I dont know if that was the CIN logo they critiqued but that logo from 70s was pretty iconic. ALthough it wasnt on the list that Montreal logo always rankled me. "ELB" what the hell does that mean? I thought for years that was some expression in French, like "Free Quebec" or something. I dunno it was stoopid. The Cubs logo always works for me. I would prefer the Yankees adopt this iconic Gotham logo. It's become a joke that every time an NFL or NBA team redesigns its logo, the animal gets angrier. When I was a kid growing up in Chicago, I always thought the Cubs logo was embarrassingly simple. Now as an adult, I think the Cubs logo is classically simple. I like some of thr alternate logos better. Thr Pirates have one with a Buccaneer, and I much prefer the cartoon Oriole. Then there are the superior Indians and Braves logos that are no longer allowable for an enlightened age. Tradition is huge for me, so I rank the Sox highly. Too bad they wear those stinky batting practice tops so often. The Brewers Mb glove logo is the greatest. Or maybe the Expos. When I was a kid, I cut all th logos off a cereal box and kept the standings in a small gift box with felt on the bottom. Twenty-four teams at the time. Of the top 13, only the Red Sox I find not pleasing aesthetically. (I'm a huge fan of the B that they have on their helmet, my first non-Cardinal batting hat was the Red Sox one because I loved how it look) Obviously I'm biased to the Cardinals, but the Cubs logo is pretty nice , the Mets is fantastic, and I think the Brewers logo is also pretty good, and I would have preferred to see the ranking for the NYY logo, not that top hat one. But I could personally see any of the Blue Jays, Mets, Cardinals, Phillies, being number one, maybe even the Mariners. Looking at the 30 they shown, the only ones that don't work for me are the simplest ones (Indians, Rockies, Padres, Pirates---although you really do need to see it on a black background to better appreciate it--) Beyond that, I pretty much like every other one out there, but I do think that the Dodgers and A's are too high, the Giants too low. Agree with both, that mb glove was what I immediately thought of when I saw the headlines(and then I also thought of the Expos) both were perfect designs imho. To this day, my wife cannot make sense of the Expos logo, no matter how many times my one son or I have explained it to her. And we're going to be married 35 years this October in spite of that! 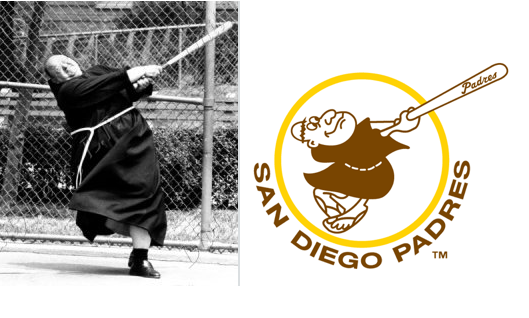 I like the Swinging Friar best for the Padres. Expos had a very distinctive logo, but I swear they had already moved to Washington by the time I saw the "M" in it. My wife realized the Mb logo about six years into our marriage and after attending or watching a few dozen games w me. ####### hoosier. When I was a kid, I cut all th logos off a cereal box and kept the standings in a small gift box with felt on the bottom. I lived a life of leisure as a youth - had the refrigerator magnets, and would change the standings a few times a week to reflect teams moving up and down. my older sister had a friend who could not resist messing around with the order. she was mean. The Brewers Mb glove logo is probably one the best logos in the history of North American sports. It's smarter than every other baseball logo by a large margin. You had magnets? Heck, you had a refrigerator?? I had, still have in fact, some pins that came with Crane's potato chips, but of course collecting a complete set meant either superb luck or eating a boatload of potato chips, so I never was able to organize a standings board with mine. I see where a single pin now goes for about what fifty bags of potato chips would have cost in 1965. I don't think there is going to be anyone who disagrees with this, it was just a super incredible design. There was the subtle suggestion that if you squint your eyes and keep a good distance the Expos logo looks like "cb" which are the initials of Claude Brochu. I see where a single pin now goes for about what fifty bags of potato chips would have cost in 1965. So that's what, like 5 bucks? C'mon, gang, let's chip in and get BDC the full set! Don't care what is considered official, there is no question that the interlocking N and Y for the Yankees is (and with no serious competition) the most iconic, most famous, most recognizable and most winning logo not only in MLB but in all of professional sports. The first team and the first city in the country. To all of those second cities and lesser teams - sorry. The Nike swoosh says: "Hello." is the Dallas Cowboys star. Pretty sure it is Real Madrids crest. I spent 3 weeks in Myanmar about a decade ago - certainly the most closed off part of the world I've been to. At the time, internet access was hyper controlled, and English language music, for example, was not allowed (although I did hear hilarious Burmese versions of "Big Pimpin" and "Strangers in the Night"). They did have American movies - I watched "National Treasure" with a Burmese audience. You couldn't use credit cards anywhere. Anyway, nobody in SE Asia knows the slightest thing about baseball. Soccer is extremely popular, especially the Premier League, and basketball is fairly popular. But despite all of that, there were Yankees hats everywhere. Everywhere! If I had to guess, I would say that the Burmese donners of Yankees hats didn't even know what the hat was except that it was cool because it was American. So I do think that the NY logo has a good argument for most recognizable logo, worldwide. The Dallas Cowboys star isn't even in the conversation. Some random YouTube video the other day featured some kid walking some city street in some European country where at least 2 bystanders were wearing NY Yankees caps. Disgusting. I would say that the Burmese donners of Yankees hats didn't even know what the hat was except that it was cool because it was American. Same thing in Thimphu. When the school day is over, off comes the བགོ, and on goes the Yankees cap. The Brewers are wearing their bm era uniforms today. What's that? The discount pharmacy? If you want an angry sock you have only to look to Australia. The leader of our community book club is a former US ambassador to Myanmar (90s, I think). Also did Cambodia, where mostly he had to deal with parents of kids who were blown up stumbling upon unexploded ordnance from the Viet Nam War. He only talked about it once, and it was with profound sadness. Considering the Dodgers’s history of excellent pitching it makes sense to show a pop out. An earlier Brooklyn logo with a lower angle. I was surprised the Twins still use that horrible round thing from the 91 Series. Their TC logo is tremendous and miles ahead of whatever the official submitted icon was. They also have a great secondary sleeve logo with the two guys (Minne and Paul) shaking hands across the river. It's also the center field HR sign, so it scales well! As a kid, I always wondered why it said "e-l-b". Figured it must be some French thing.